Maybe you are not familiar with the concept of Dim Sum. Neither are the Catalans here! They call it Asian tapas, giving it a twist of their own. But however you want to call it, if you are craving Asian comfort food Mosquito is definitely the place to be. It is a tiny bar in the middle of the Born neighbourhood – don’t expect any fancy decorations. Squeeze into one of the wooden tables and wait for the food to amaze you. The menu might need some explanation so don’t hesitate to ask the staff to help you out! 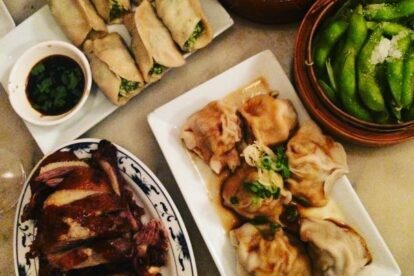 Their specialty is dumplings, but also expect heathy edamame or mouthwatering fried duck. I love it all. All the dishes are to share and the quantity per portion is quite good. It does leave you with the problem that you’d probably like to order all of it but you will have to make some choices!